The first ever UK Stroke Assembly to be held in Northern Ireland will be held in Cookstown’s Glenavon House Hotel on Monday, April 8. 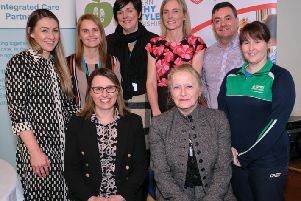 The popular one-day event has been welcomed enthusiastically by the local Mid-Ulster Stroke Support Group whose members have worked tirelessly with the charity to bring the event to Northern Ireland. The UK Stroke Assembly Northern Ireland will be a fun, upbeat and inspirational day-long event. It’s also an opportunity for stroke survivors, carers, volunteers and supporters of stroke groups to meet and have their say on stroke and plans to reform hospital stroke services. Attendees are encouraged to share experiences and learn about developments in stroke care and research. Themes include stroke recovery, Tired of Fatigue, speech and language therapy, campaigning for change and Singing for stroke. Speaking at the event is local stroke survivor and campaigner Clodagh Dunlop, from Magherafelt, who continues to make a remarkable recovery from locked-in syndrome. Cookstown stroke survivor Derek Short has campaigned for years to bring this inspiring event to the area. Derek, now aged 76, had a stroke in September 1999. He was 56 and worked as a Probation Officer at the time. Derek is a founding member of the Mid-Ulster Stroke Support Group. They meet weekly in the First Presbyterian Church in Cookstown. The group has 26 members and, although Derek has now stepped back from Chairing the group, a role now occupied by fellow member Mary Convery, Derek is immensely proud of what the support group has achieved in 20 years.